One of the most exciting and challenging treks in Khumbu region, the trip explores Everest base camp, Cho La pass, and Renjo-la. Renjo Pass Everest Base Camp Trekking is a long trek for adventure lovers to the base of Mount Everest, the highest mountain in the world. The trek is a mixture of adventure, culture, and natural beauty within 3 weeks. It explores Namche, Thame, and Lukla (home to Sherpas) and other places en-route with their own unique cultures. One can experience the lifestyle of different ethnicities with their feasts and festivals in Kathmandu as well. 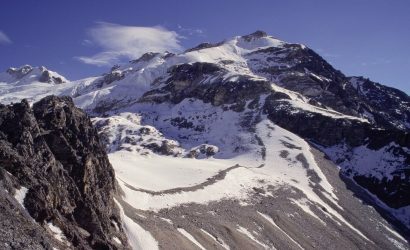 – Peaks like Everest, Lhotse, Nuptse, Ama Dablam, Cho Oyu, Makalu and others. One of our representatives will pick you up at the airport and transfer you to the hotel. You will enjoy an authentic Nepali dinner and will stay overnight in Kathmandu. We will take an early morning flight from Kathmandu to Lukla. The 35 minutes long flight is exciting as we fly over tall buildings to fields and the mountains of Khumbu region. We land in Lukla airport, one of the most dangerous and exciting airports in the world. From here, we walk across Dudh Koshi valley, crossing the river in suspension bridges to reach Ghat. After that we cross a ridge to finally reach Phakding. We stay here overnight. On this day too, we move along the Dudh Koshi valley the entire day. We cross the river several times on suspension bridges covered with prayer flags. After the last crossing, we make a steep climb before reaching Jorsale. We pass through pine forests with the splendid peaks in the background to reach Namche. We spend the night here. We rest in Namche, the last village in the region, to acclimatize to the increasing altitudes. There is a school, a hospital and Syangboche airstrip to visit here. 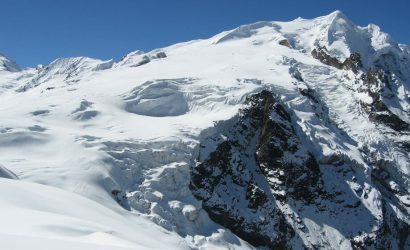 It is a tourist hub with a number of hotels and shops to buy trekking gear. There are a few options to make a day’s hike to the nearby villages. First, we hike to Khunde and from there move to Khumjung, the largest village in the area. This village at the foot of Khumbila peak is famous for its bakery and museum at the highest altitude in the world. After enjoying the splendid views of Everest, Ama Dablam, Lhotse, and others we return back to Namche. From Namche, we take the route to the west that leads to Thame. Travelling on a leveled trail we reach Bhote Koshi Valley. 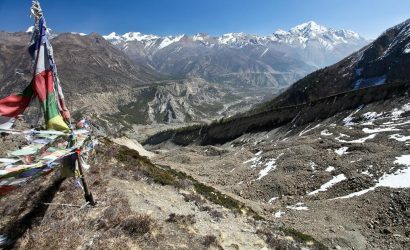 The prayer flags, Mani walls and carved stones in the trail are important to the Tibetan-Buddhists of the area. 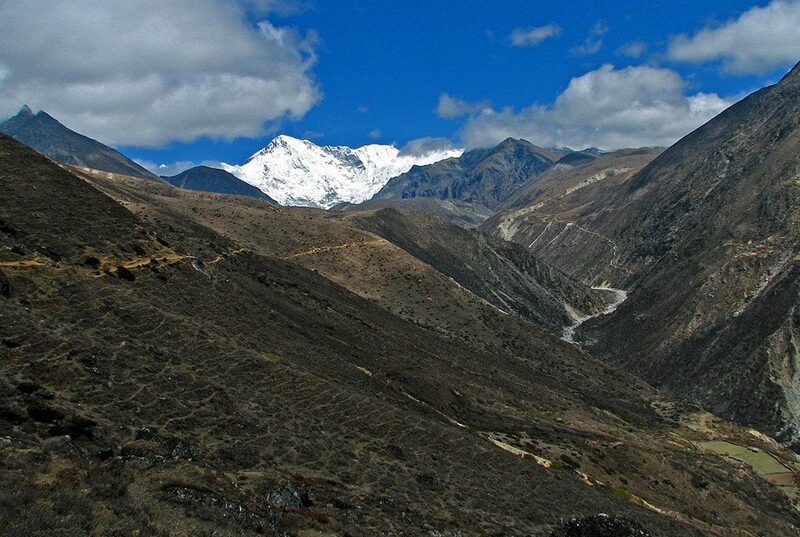 From Bhote Koshi, the trail ascends steeply to Thame where we see Teng Kangpoche and Kwangde peaks. Thame Gompa is a famous site here, located above the village overlooking the valley. It is known for the spring celebration of the Mani Rimdu festival. From Thame, we take trails that are mostly uphill climbs to Langdhen. We pass through walled, Sherpa villages with their unique cultures. If we are lucky we also see some flora and fauna of the region. As we follow our route, we also meet yak caravans that trek along the trail leading to Langdhen. We spend the night here. On this day, we complete a long and difficult trek to Gokyo Lake via Renjo la pass. The trail makes steep ups and downs as we pass through sandy ridges. We walk past streams, rocks, yak pastures and the twin Renjo lakes. 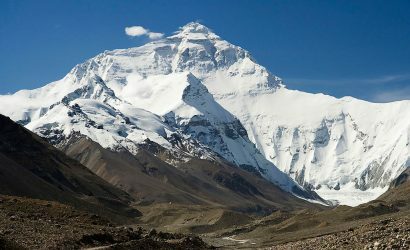 Along the way, we enjoy the magnificent views of Cho Oyu, Lhotse, Nuptse, Mount Everest, and others. After enjoying the great views from the top, we descend and then walk on leveled trail to reach Gokyo Lake. We stay here overnight. We stay around Gokyo on this day to acclimatize and explore the beautiful area. We make an early morning steep climb up to Gokyo RI at 5357m. 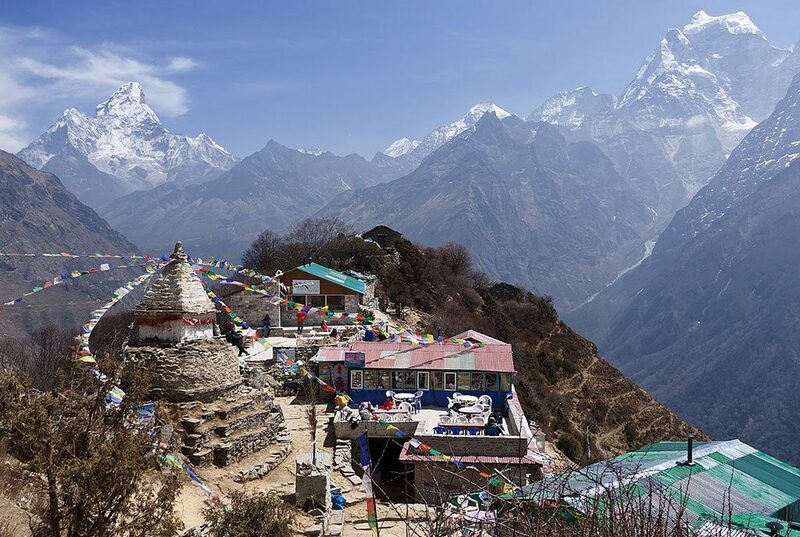 We enjoy the spellbinding views of Ngozumpa glacier, Gokyo valley, and the Himalayan range in Khumbu region. We can spot Cho Oyu, Lhotse, Nuptse, Everest, Makalu, Cholatse, Tobuche, and other peaks in the region. After a tranquil experience, we return back to Gokyo to spend the night. From Gokyo, we walk past the second lakes and Ngozumpa glacier to finally reach Dragnag. We spend the night here. This is a long and difficult day that requires an early start. Cho la pass is a highlight of the trip which is difficult due to the steep, icy trails and glacier traverse in the eastern side. We walk on rocky, steep and vertical trails that can be slippery. We climb through a ravine and rocky trail to finally reach Phedi. From here, we ascend to greater heights accompanied by enchanting views of the peaks. After we pass through the side of a frozen lake, we reach the top of Cho la pass decorated with prayer flags. We get clear, spellbinding views of Ama Dablam, Cholatse, Lobuche, Baruntse, and others from the top. After passing through some crevasses, we reach Dzongla with views of the peaks along with Pheriche village below. We spend the night here. The trek from Dzongla is a short, beautiful trail that leads to the beautiful village of Lobuche. We spend the night here and rest for the remainder of the trek. From Lobuche, we walk through the lateral moraine of Khumbu glacier. After a while, we make an ascent to reach Thangma Riju from where we enjoy 360 degree panoramic views of the Khumbu peaks. We climb through Changri glacier where we get the first glimpse of Kala Patthar. We reach Gorakshep and enjoy the views of the Himalayan giants including the highest mountain in the world, Mount Everest. After enjoying lunch at such high altitude, we take an excursion to Everest base camp. We take the trail past Gorakshep Lake and through Indian army mountaineer memorials. 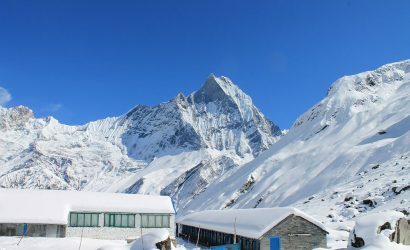 We see the trekkers’ tents being set up for Everest expeditions; some of which are cozy enough to give us a sensation of a luxurious Everest Trek. Mount Everest is not visible from here. We return back to Gorakshep for the night. From Gorakshep, the trek to Kalapathar mostly constitutes of steep climbs and bends. 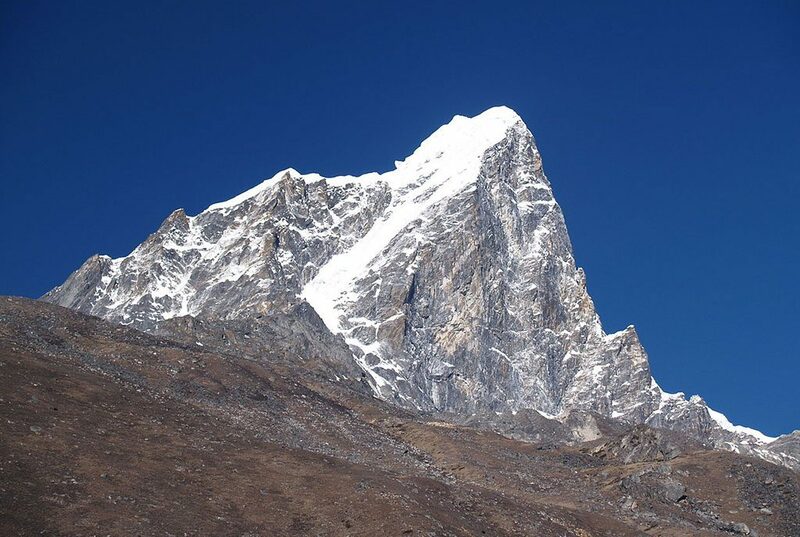 Kalapathar is a thump in the Khumbu region with its summit at 5545m. From here, we can enjoy the sunrise view along with the peaks like Everest, Lhotse, Ama Dablam, Kusum Kanggru, Thamserku and many others. We also explore lakes and icefalls in the area along with the intimidating views of Pumori and Everest right in front of us. 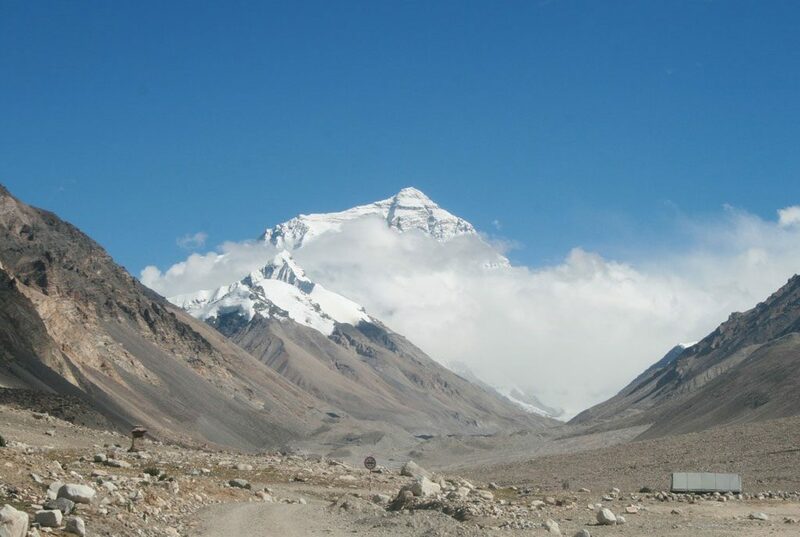 After the excursion, we trace our steps back to Gorakshep and then continue towards Lobuche. After crossing a river, we take the trail on the left leading to Dingboche. It is an easy descent to Dingboche where we spend the night. It is a rest day that we spend exploring the Dingboche area. After visiting the Dingboche monastery, we start out excursion to Chhukung village. From the village we make a steep climb to the Chhukung RI for the panoramic views of the surrounding peaks. We trace our steps back to Dingboche where we spend the night. From Dingboche, the route mostly makes steep descents crossing through various villages. After some time we reach Tengboche, one of the favorite destinations of this region. 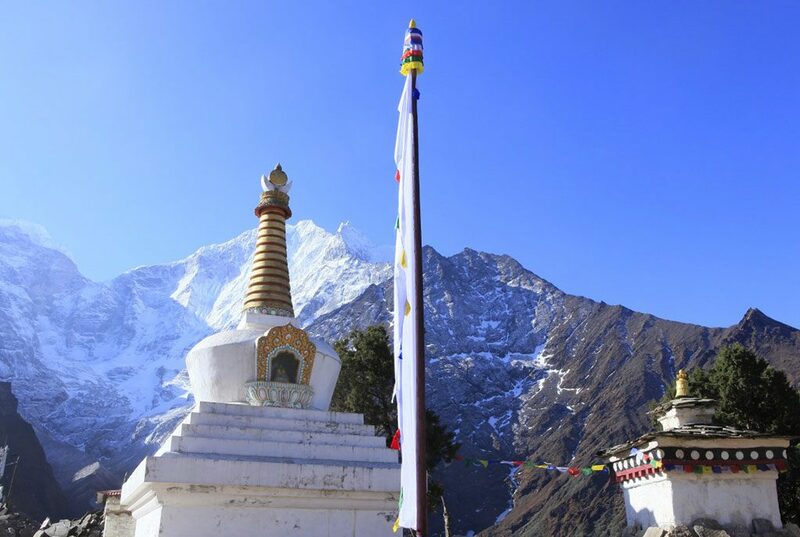 It is famous for the Tengboche monastery atop a hill which overlooks the valley. 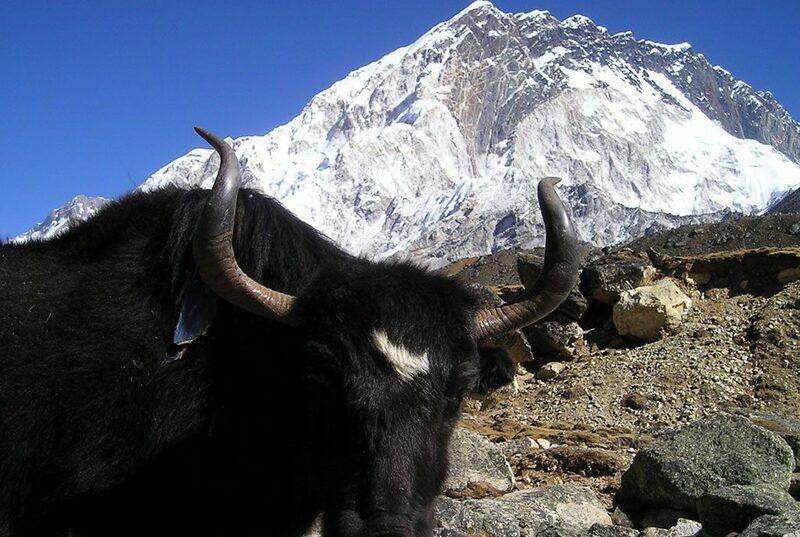 We get to witness majestic peaks like Everest, Lhotse, Ama Dablam, and others in the region. We stay here overnight. 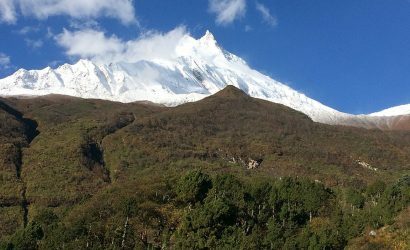 From Tengboche, we pass through pine and rhododendron forests as well as waterfalls to finally reach Namche. Namche is a famous hub with lodges and shops where all the people in the route get to socialize with each other. We spend the night here. From Namche, there is a difficult descent through rocky cliffs to reach Dudh Koshi River. After crossing a suspension bridge, the trails levels and passes through lush green land to finally reach Phakding. We spend the night here. It is a short, easy walk to Lukla as we enjoy the sceneries in the crowded trails. We stay the night here. We take a flight back to Kathmandu from Lukla airport. It is considered to be one of the most dangerous airstrips in the world for the short runway and the presence of a cliff and hill just in front of it. We fly from over the mountains to the busy city of Kathmandu. We end our journey in Kathmandu. We have a leisure day for sightseeing around Kathmandu. We can visit the Durbar squares, temples and stupas of the city. We can also buy pashmina, thangka, statues as souvenirs. We finally entertain you with a farewell dinner in the evening. This trip can also be customized as per your need. Tell us about your requirements and what you expect from the trip, and we will help you design a trip with comfortable itinerary to best meet your needs. Please contact us here or on +977 9851-060902 (WhatsApp, Viber, Line, Wechat, IMO). We will get back to you within 24 hours.